Can't believe it. This really works!! But I want to know out of how many times can this deck run this combo once successfully? kuro did you attack with other monsters? hopper says Other monsters cannot attack the turn you activate this effect. Field spell goes to the field spell zone. So they do not get in the way of Leo's effect! Good time, Percy. Maybe I'm not the first persno who asks this, but: will you add anime exclusive (or Tag Force exclusive)cards. As for me, I just need T.G. anime cards (Gear Zombie, Drill Fish and Metal Skeleton). Cup of Ace is Broken, it lands on head 90% of the time. Essentially giving exodia decks pot of greed. will new update come soon? "will new update come soon?" Percy or someone can send me a link for ipmana ? free one. Garmr of the Nordic Beast's effect doesn't work when it attacks a Level 4 or lower monster. It only works when being attacked despite saying "battle". Nordic Relic Megingjorg isn't supposed to activate when i don't control a Nordic or Aesir monster but my opponent does. Odin's Eye. Very annoying. 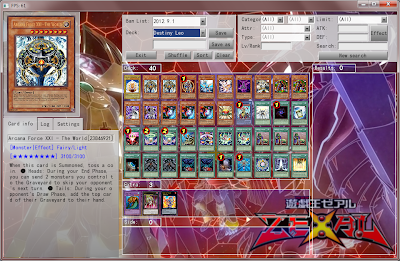 Its effect is trying to activate every turn even though i dont' have an Aesir monster. These need fixing. Thanks if you do. Oh yeah. are we only using OCG ruling for Vanadis of the Nordic Ascendant? I want to send Gulfaxe of the Nordic Beast, but it doesn't. Well everyone Kaito's pack is finally here which means new photon/galaxy cards! YAY! Please Also Add "Photon Satellite"
Thx & And Hope u r In A Good Health. Why don't settings persist between restarts of the game? 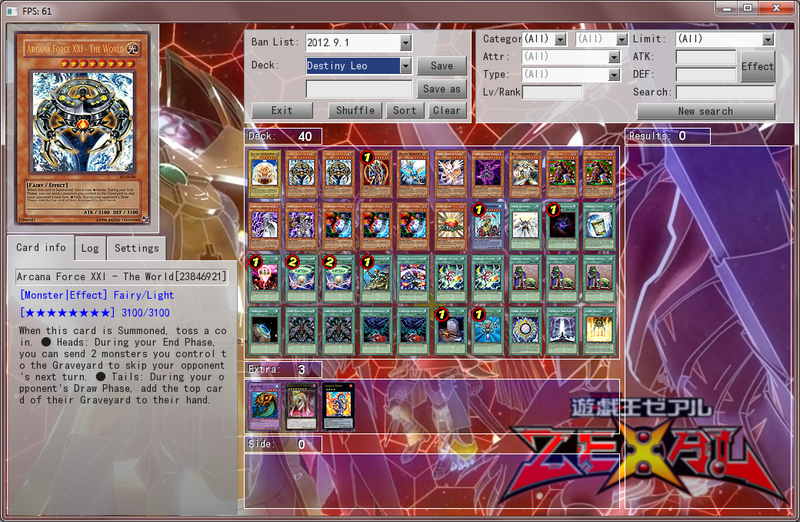 Also, why when a dialog comes up (for example, choose a card from your deck) can I not check my graveyard/RFG/etc.? I think there was a mistake with Dododo Warrior. I attacked my opponent's E-HERO Absolute Zero with my Dododo Warrior after Summoning it without Tributing, then I used Forbidden Chalice to get its ATK up. So, I destroyed it and expected my Dododo Warrior to be destroyed, but Absolute Zero's effect got negated by my Dododo Warrior. when u summon frog during SP and u use fast MST suppose to make miss timing for frog. percy just sayin that I love Touhou too XD. hello, I really liked your deck, I really want to have a special summon deck could send you mine to see you like this and you tell me what to improve?